For the few of you who check my site and youtube daily I am sorry since my wife's illness I've been a lazy lazy man. Gotta get out of these routs. More on topic... You can check out Strong Bad's post here on SmashBoards about Smash 4's new method of influencing your direction after being hit by an attack. He calls it "Vectoring" but I think "VI" is a little easier to say. Personally I think it is a little more intuitive than DI, but since it is a little more difficult to wrap your head around if you are an experienced smasher so I made a little picture. Basically, and this is a simple version mind you, with directional influence(DI) you could change your trajectory but not the length of distance traveled. With vectoring (or VI) you CAN change the length of distance traveled. 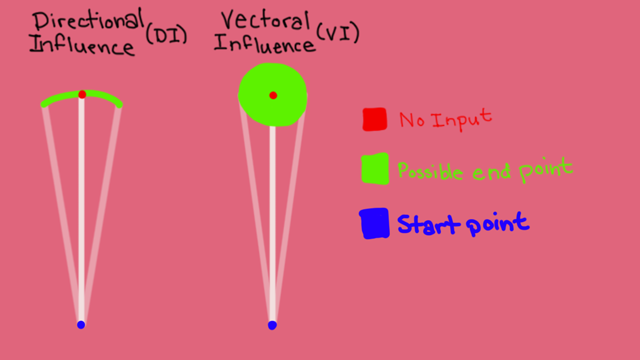 By picking a direction to hold you add a vector going that direction to the direction knock-back vector. What are the applications of this? You can use VI to make you end up closer to your opponent so you are sour spotted or so they overshoot. You can use VI to live longer. All and all when it comes to extreme knock-back there isn't much difference in the application between DI and VI. where the application will truly be noticeable is actually at lower percents. Instead of a curve of possible locations to choose from after being hit like in previous titles you have a much wider range of options that you opponent has to adapt to. yep yep... so all credit goes to Mr. Strong Bad on this one. I'd link to his twitter or something but I don't have it... so I guess you can follow me instead because I made a pretty picture?